EDWARDS AFB – The 31st Test and Evaluation Squadron hosted a Comprehensive Airmen Fitness Day recently, which was about exploring the physical, mental and spiritual aspects of personal resiliency. 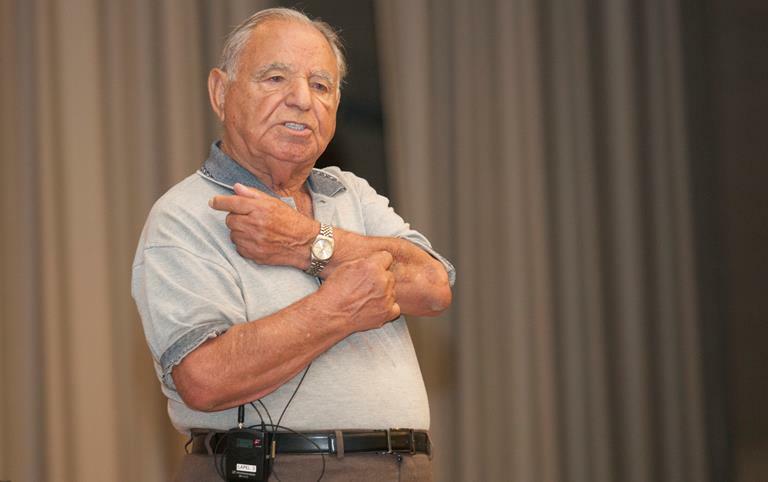 Guest speaker, Jewish holocaust survivor Albert Rosa, shared his story of resiliency at the event. Rosa was born in Greece to an upper middle class family. He was one of eight children, and his father worked in the hardware industry. His eldest brother, Daniel, was a professional boxer and taught Albert to box at a very young age. It was during his seventh grade year that Italy declared war against Greece. Rosa recalls being sent home from school and the principal’s promise that he would “call them back” when the war was over. “Over 70 years passed, they never called me back. I lost my education,” said Rosa. After Italy was repelled by Greek forces, Germany invaded and within a month had occupied the country. “Germany at the time was the most powerful country in the world, it took five countries to beat them. United States, Russia, England and France, and Greece put up a good fight to beat them,” said Rosa. Rosa and his brothers, along with many other Jewish men and women, were taken into captivity as slaves. Each person was assigned a number and, for the duration of the Holocaust, that number became their name. It was tattooed onto their bodies and displayed on their striped uniforms along with the Star of David. Their heads were shaved and their bodies frail from starvation. On several occasions, Rosa and his brother would remove their stars and sneak out of the ghetto at night to find food for their family. Eventually, he was transported from Greece to Poland in a box car that was once used to transport animals. They were cramped in that space for ten days and nights with no food, water or facilities. “We were not humans anymore, totally dehumanized,” said Rosa. When they arrived at the “death camps” those who were too old or too young for slave labor were sent to the gas chambers. “For a minute I forgot I was under the Nazi’s and I went to the fence,” said Rosa. He called out to her and a female guard noticed. He watched as they killed his sister. Later, he would watch his brother Daniel die too. Rosa, desperate for food, stole a few raw potatoes. The Nazi guard who caught him ordered a guard dog to attack with deadly force. Daniel, who was 10 years older and much taller than Rosa “couldn’t take it anymore.” He “screamed like a wild animal” and began to choke the Nazi to death. Later that night, Rosa watched as Daniel was hanged. Rosa recalled the year 1945 and how Germany was losing the war. Orders were given to kill every Jew before the Allies arrived. He realized he had nothing to lose and along with several friends, decided he would escape. Some did not make it, but Rosa took refuge in an American Army camp where he later was given an American uniform and an opportunity to avenge his family. After the war, Rosa was awarded several medals for his bravery in the United States Army, including a Purple Heart. He encouraged others around him to find the same bravery within them. “If you have to die, die fighting like a man,” said Rosa. Rosa started a new life with his wife, Betty, but eventually started suffering from Post-Traumatic Stress Disorder. He was placed in a hospital for mental health and administered shock therapy treatments. He began to forget about his wife and children, becoming a “zombie.” When he decided to end his treatments and the memories returned, the doctor advised him to keep quiet about his experiences. He claimed that no one would believe Rosa, and for many years, Rosa would not talk about the holocaust. Today, Rosa shares his story openly. 5 comments for "Holocaust survivor ‘owes life’ to America"
I can’t believe that people still deny the Holocaust. Mr. Rosa you are one brave man and quite the champ. Live on brother. I too owe my life to the United States. Had it not been for the Americans my grandparents and would be parents would have been killed by the Japanese. If I had to be called one day to serve the USA I would without any hesitation do so. Not to diminish what Jewish people went through during this period of madness, but please let us not forget all the other “undesirable” people that suffered and died: homosexuals, the mentally and physically handicapped, gypsies (from whom I’m descended, barely), political dissenters, writers, artists, musicians and the list goes on. These people need to be remembered and sadly, very little is ever said about them. Thank you to Mr. Rosa for his courage (both then & now) & willingness to share his story of resilience. My prayer and hope for our world is that every child be safe, loved and able to thrive.